Saint John’s music career has gone from hitchhiking and performing in the streets of Europe to opening shows for national touring acts and recording with Peter Buck of R.E.M. From 2014-2016 he performed over 600 shows throughout the Pacific Northwest, had some songs played on local radio stations, endorsed a PA System from Mackie and was featured in Performer Magazine, was recently chosen to endorse Reunion Blues music gear, has a beer named after one of his songs (Kumbaya Supernova IPA! ), and isn’t slowing down anytime soon. 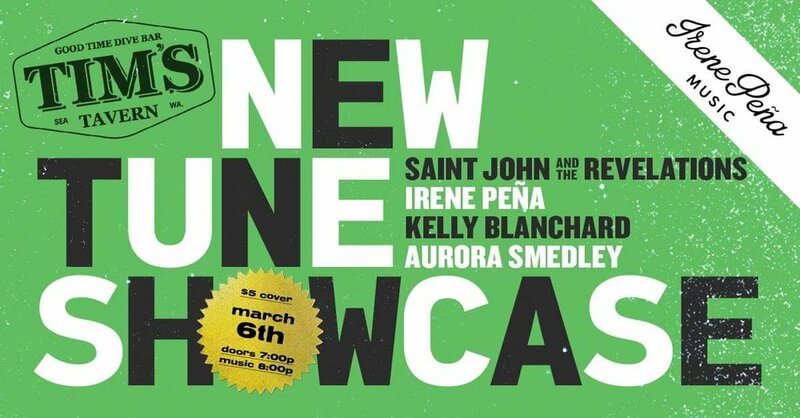 New Tune Showcase host and promoter Irene Peña switches gears and brings you a set to include something *new*! Since the independent release of her debut album “Nothing To Do With You” in 2011, this singer-songwriter has maintained a more-than-steady relationship with music. Most recently, she released the well-received “Trying Not To Smile” EP in 2017. She'll easily convert her jangly power pop tunes to peppy acoustic sets that have managed to rise above the din of the venue. She's also kept a pocketful of bandmates close by in order to step things up OR staff her dance/party cover band for hire. True encourager (and now participator) of *new* music - please join her on March 6th and at www.irenepenamusic.com ! Songwriter Kelly Blanchard of Blue Star Creeper has been performing in the Northwest since 1990 and has played live at most Seattle clubs, busked the city streets, and performed at Burning Man, Doe Bay Resort, The Snorting Elk at Crystal Mountain, Northwest Folklife, Yakima Folklife, Index Arts Festival, on local radio and TV shows and the Perthshire Amber Festival in Scotland as a member of SeaStar. He formerly hosted the Tuesday night Open Mic at The Ould Triangle pub and records and produces music out of his home studio. Aurora blends haunting lyrics with sultry tones and powerhouse vocals. Her performances are vivid and spellbinding.